New book, some shelf wear to jacket. 409 pages. This is the story of teamwork and cooperation between counterintelligence agents of the US Army, the CIA, and the FBI. 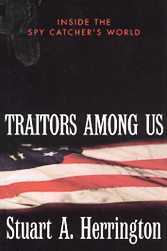 It is also the hitherto untold story of how during the Cold War, American counterspies collaberated closely with German, Swedish, Austrian, and Italian security officials to unmask traitors among us who were selling top secret plans for the defense of Europe.